Global prime defence contractor and shipbuilder Austal has rolled out the first of two Cape Class Patrol Boats (CCPBs) at its Henderson facility in Western Australia. Built for the Royal Australian Navy (RAN), the CCPBs' roll-out marked the end of the main construction phase of the Australian Defence Vessel (ADV) Cape Fourcroy. The 58-metre all-aluminium monohull vessel will be launched this week and delivered to the Navy in April 2017. Sister vessel ADV Cape Inscription will follow in May 2017. ADV Cape Fourcroy and ADV Cape Inscription will be leased to the Navy until at least 2019, supplementing the current Armidale Class Patrol Boat fleet. The total cost to lease the vessels is expected to exceed $3 million a year. ADV Cape Fourcroy is the ninth CCPB designed and constructed by Austal and the first to be provided to the RAN. 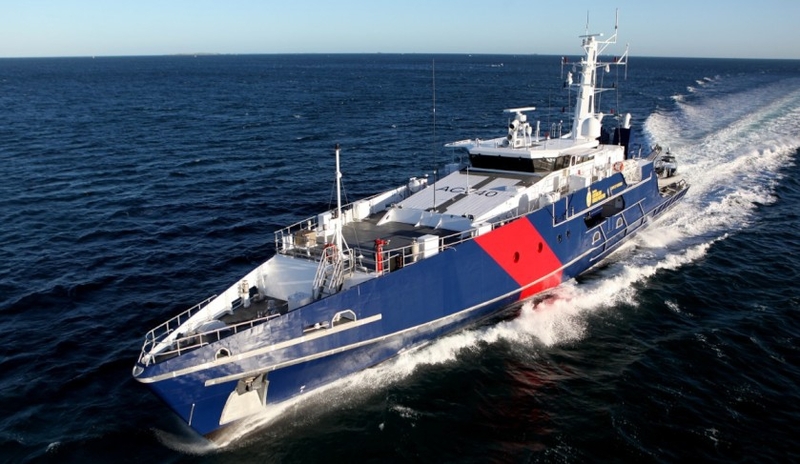 The eight earlier Austal-built CCPBs were delivered to the Australian Border Force (previously known as the Australian Customs and Border Protection Service) between 2013 and 2015 as part of a $350 million design, construct and service support contract. According to Austal CEO David Singleton, over 340 Australian suppliers have been included in supporting the Cape program. The CCPB vessel has a top speed of 26 knots and a range of up to 4,000 nautical miles. With a crew of 22, the vessel can undertake a 28-day patrol in up to sea state four, Singleton said. The lease will support the RAN’s patrol capabilities and cover the void in the fleet following the decommissioning of Armidale Class Patrol Boat HMAS Bundaberg after a dockyard fire in August 2014. The additional RAN patrol assets will strengthen the maritime people-smuggling and border protection program Operation Sovereign Borders. The ships will be utilised across a broad range of operational tasks including counter-terrorism, irregular maritime arrivals, illegal exploitation of natural resources, piracy, robbery and violence at sea, illegal activity in protected areas and marine pollution. The Minister of Defence Industry Christopher Pyne said the roll-out affirmed the Turnbull government’s commitment to using local industry to meet defence capability requirements. “Austal is a prime example of Australian defence industry successfully delivering not just for Australia but capabilities for defence forces around the globe, including the United States Navy,” he said.